October 19, 2012, West Hartford, CT – American Institute West Hartford was a proud sponsor of the 19th Annual ING Hartford Marathon event on October 13, 2012. The campus had been preparing for this event since the end of August and was excited to participate. Not only did West Hartford campus create their own team to participate in the 5K race on Saturday, the campus also participated in the Healthy Lifestyle Expo at the XL center on October 11th & 12th. At the Expo, Medical Assisting students took blood pressure readings of the attendees and future runners at the American Institute booth. After the two day Expo, AI packed up their booth and moved to Bushnell Park for race day where the blood pressure readings, fun and giveaways continued. 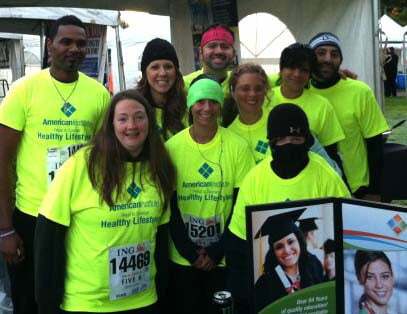 It wasn’t difficult to spot our West Hartford American Institute 5K team in their bright green shirts!